When is an asteroid not an asteroid? When it’s a binary pair. Turns out that an asteroid discovered late last year is actually two gravitationally bound objects in orbit around each other. But this particular duo, dubbed 2017 YE5, belongs to an exceptionally rare class of near-Earth objects. 2017 YE5 came to within 3.7 million miles (6 million km) of Earth on June 21, which is about 16 times the distance of the Earth to the Moon. Using bistatic radar – a technique in which the transmitter and receiver are placed in separate locations – astronomers at NASA’s Goldstone Solar System Radar (GSSR) in California scanned the object, finding they had a pair of asteroids on their hands, not one. These observations were later confirmed by astronomers at the Green Bank Observatory (GBO) in West Virginia. Artist’s illustration of asteroid 2017 YE5's trajectory through the Solar System. 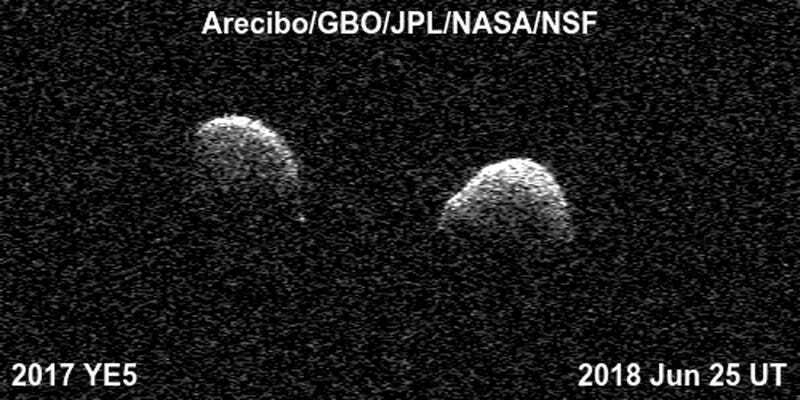 Observations showed that the two asteroids orbit each other once every 20 to 24 hours or so. Also, the asteroids turned out to be larger than expected; these rocks are very dark, about as dark as charcoal, making visual observations difficult. Radar scans revealed their true size; each asteroid measures about 3,000 feet (900 meters) in length. That said, their radar reflectivity patterns were wildly different, which suggests these objects, while similar in size and mass, feature different densities and/or compositions near the surface. A duo, yes, but identical twins, not so much.